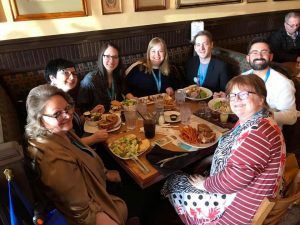 While I’ve never intended to maintain a proper Blog on this site, I did see this as an opportunity to keep track of some of my favorite conference experiences over the years. 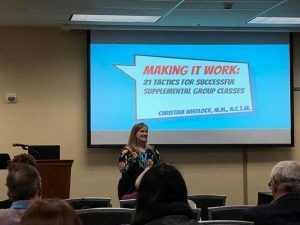 With MTNA 2019 wrapping-up less than a week ago, now seemed like an ideal time to get started! I started Sunday morning at 8:00am in a Showcase with Paula Dreyer and her Little Gems for Piano series. These books utilize rote teaching, sequenced with concepts from Irina Gorin’s method, Tales of a Musical Journey (re: non-legato articulation to start, beginning with 3rd-finger-only, etc). I was particularly intrigued by her newest book the Advanced Primer, which is a partnership between Paula and MLT-guru, Marilyn Lowe. Like many of my colleagues, it’s taken me awhile to “come around” to the philosophy of rote teaching, but I’m in love with the richness of sounds available to beginner students with this approach. I also appreciate the way rote teaching lends itself so easily to improvisation, keyboard topography, composing, and MLT-related concepts (sound before sight, etc). Paula was generous to gift each of us a “best of” compilation (conference freebies are the best!). I also purchased three books: The Primer, Advanced Primer, and Volume 1: Beginner. Please note: I don’t think the Advanced Primer is available online yet (and I’m pretty sure I heard she sold out at the conference? WOW!). I’m confident these will make excellent supplements for my students! When a pedal-extender is unavailable, placing a heavy book on the damper pedal is a much better alternative to having smaller students sit closer and collapse their bodies against the piano. A tried-and-true case for rote teaching: Heart and Soul! I’d never considered how complex this looks in notation on the printed page, yet countless children learn it easily. 9:15 brought a Plenary Session with famed musicologist, Alan Walker. I will confess: while I am familiar with Walker’s outstanding reputation, I did not have high hopes for this Keynote. I wasn’t sure my attention span was going to hold up for 90-minutes of biographical information on Chopin, but oh, how wrong I was! In fact, the address ended up only running 60-minutes, and I was definitely left wanting more. Alan Walker is known for his delivery, and he did not disappoint. His storytelling really is quite captivating, and his research on both Liszt and Chopin is quite possibly unparalleled. I cannot wait to read the book (in Walker’s accent, of course)! Chopin studied composition formally, but was largely self-taught on the piano. The Etudes (Opus 10) were started when Chopin was only 19 years old. Contrary to what some think, Chopin’s favorite instrument was the human voice. There are numerous stories of vocalists moving Chopin to tears with their performances. It appears he was particularly fond of the bel canto style of singing (no surprise here, of course, based on the profound vocal qualities of his piano works). Chopin’s views on technique were seen as a rebellion to Czerny’s school of “finger-equalization”. Instead of attempting to strengthen each finger equally, Chopin embraced the idea of each finger having its own color. He believed the third finger, for example, to be “an excellent singer”. Walker referenced an “11th Commandment”, which I will paraphrase as this: When performing Chopin, if you play everything exactly as it’s printed on the page, you are simply replicating it. If you take too many liberties, the intent is lost entirely. We must seek that fine line down the middle. The Keynote included many beautiful audio examples, but Walker concluded with Rubenstein’s performance of the Berceuse, Opus 57. This is simply exquisite, and a fitting conclusion to this celebration of Chopin’s contributions to our field. I’ve also added this album to my must-purchase (or, more fitting, the why-on-earth-do-I-not-already-own-this?) list. Another confession: I often have “session envy” at events like MTNA, when events are scheduled 8-sessions deep. I find myself constantly wondering if I made the right choice. The less-experienced version of myself used to “session-hop” to try and get a taste for everything, but – as many have already learned – if you try to learn a little of everything, you end up with a lot of nothing. As a proud Indiana resident, I was BEYOND excited to celebrate our 2018 Commissioned Composer, Benjamin Krause, who ended up winning the 2019 MTNA Distinguished Composer of the Year. This is a presentation I often skip in favor of something else, but I am oh-so-glad to have attended this year. Krause began with a performance of his winning composition, Taxonomies of Pulse (a piece for Piano Duo, performed with his fabulously-talented wife, Christina Giuca, who is phenomenal in her own right and happens to living out some of my most ambitious career goals). MTNA Commissioned Composer Chair, Ann Rivers Witherspoon, then led a riveting Q+A for Ben (Christina sat this one out, as she was under the weather and losing her voice). The session concluded with an encore performance of Taxonomies, which I really appreciated. I find such inspiration in contemporary works, and am thankful for my opportunity to attend this session. Another confession: I almost didn’t attend this session because I know a wealth of the research/coping techniques for performance anxiety. Then again – as was the case here – there is always more to learn! Eliminating anxiety is not an attainable goal. We must name it, accept it, and learn to play well with anxious feelings. We must feel the fear, and do it anyway. As performers, we must be willing to accept some amount of discomfort. Responses to stress become magnified around age 13. When school is in session, studies have shown teenagers are the most stressed demographic in our country. We should never dismiss the amount of pressure they are under. “Switch-cost” – it can take 20-25 minutes for students/ourselves to re-adjust after text/technology interruptions. Performance skills require us to focus on doing, rather than how-to-do-it. Best results come from having students focus on WHY we perform, re: sharing music. Broad, communal goals – rather than self-centered goals – yield better results. Try to have students memorized 30 days in advance of performance. Pianists get fewer “performance” opportunities than other instrumentalists, who spend hours in ensemble rehearsals (in essence, performing). Relaxation Techniques: Some are “muscle to mind” (deep breathing, stretching, progressive relaxation); others are “mind to muscle” (meditation, prayer, imagery). I concluded Sunday’s activities with the East Central Division Meeting (if you’ve never attended your Division meeting, I’d highly encourage it! ), and a lovely Italian meal with other Indiana conference attendees. I’m not sure if we’ve ever laughed so much at a state dinner. I never cease to be both entertained and inspired by my fellow Indiana teachers. Monday morning, I split my 8:00am showcase time between Hal Leonard and RCM presentations. Hal Leonard was featuring Phillip Keveren, and RCM was discussing the pathway to well-rounded musicianship. Both sessions gave wonderful freebies! 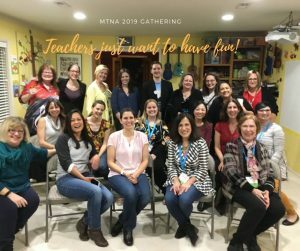 MTNA’s Accelerated Learning Track on Monday morning has turned into one of my favorite segments of the conference. I won’t lie; as a presenter, 20-minute sessions are kind of a nightmare. 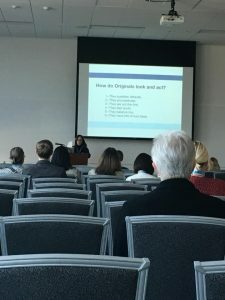 As an attendee, however, I appreciate the fact that presenters must eliminate ANY excess information and give you only the most pertinent ideas. Using kazoos as a replacement for singing when students feel too timid to do so. This was another mind-blowing, why-didn’t-I-think-of-that concept. These are similar to the kazoos Lynnette uses. Most notably, they are dishwasher-safe, which pleases the germophobe in me. A reminder of Anne Crosby Gaudet’s charming resource, Emoji Modes, which has been sitting on my to-be-purchased list for too long. The Happiness Hypothesis, by Jonathan Haidt – uses a theory stating our mind is made up of two personas: The Rider and The Elephant. The Rider is our conscious/reasoned self, and The Elephant is our automatic/implicit self. The Rider controls, but The Elephant wants. The Rider is capable of controlling The Elephant, but can only “lug it uphill” for so long. In other words, we need to make sure The Elephant is getting his fill in our students’ piano studies. I thought this was brilliant, and can’t wait to read the book. Prepared Piano helps engage The Elephant by stimulating visual, tactile, AND auditory responses. Eraser Piano Tees, by Dorothy Gail Elliott – possibly the earliest-leveled Prepared Piano piece for students. 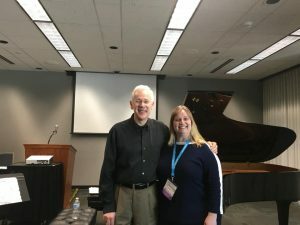 Most of all, I took away TONS of ideas for safe, simple ways to expose my students to prepared piano. We will be making this a focus of Performance Classes soon! Ping pong balls, sheets of paper laid on top of strings, etc. etc. etc. Rules for safety: Never force anything between a string, never place anything on the sound board (or allow it to bounce/fall onto it), wash/dry hands before preparing, Gaffer tape does not leave a residue. As teachers, WE are responsible for helping advance our art. We can’t present these ideas as “strange” or “harmful” to our students. 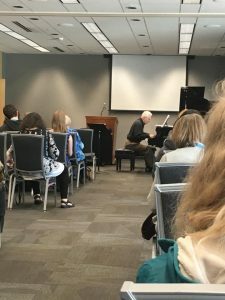 This was one of many sessions featuring the work Edwin Gordon and his Music Learning Theory. If you’re not already aware with this philosophy on teaching, you need to RUN and get yourself educated now. We want to avoid getting caught in the trap of “teaching the piece”. Instead, let’s teach music. Hannah offered a nice, quick overview of Dalcroze techniques and had some lovely interactive movements for us. One of the most simple ways to have young students listen more carefully is to identify excerpts as same/different. Students can signal “same” by holding both hands open, and “different” by closing one fist, and leaving the other hand open. Hannah covered various approaches to movement to the micro and macro pulses of music. If you’re familiar with anything Samantha Coates does, you know to expect excellent content coupled with some very hearty laughs. I cannot begin to tell you how entertaining she was in this 20 minutes. 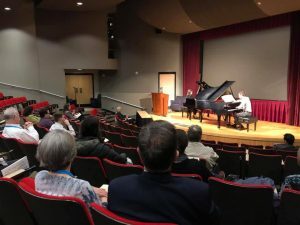 Samantha opened with a performance of the exposition to Mozart’s famous sonata, K. 545, in which she successfully committed each of her aforementioned “deadly performance sins”. It was completely on point, and one of the single most humorous displays I’ve ever witnessed. Bravo, Sam. While these “Seven Deadly Performance Sins” were all things I regularly preach to my students (sometimes word-for-word), it was quite an affirming experience. Deadly Performance Sins: 1 – Drawing Attention to Mistakes, 2 – Correcting Mistakes, 3 – Starting Too Fast, 4 – Altering the Conditions, 5 – Showing Dissatisfaction, 6 – Breaking the Spell, 7 – Ignoring the Audience. At the conclusion of her presentation, Samantha flipped things around and presented what she called, “The Seven Vital Virtues”: 1 – Ignore Mistakes, 2 – Prioritize Rhythm, 3 – Control the Speed, 4 – Have Class Rehearsals, 5 – Keep a Poker Face, 6 – Cast a Spell, 7 – Love the Audience. In case you aren’t aware, Samantha has a number of terrific resources, including her ABRSM companion series. Okay, so I’m just being cheeky here, because…of course I attended my own session! I had so much fun preparing and giving this session. I am convinced my studio’s supplemental performance classes play a crucial role in my students’ development, and we have a lot of fun, too! If you’re curious to know more, feel free to contact me. Monday evening was spent at a fellow teacher’s home, enjoying a gathering for the readers of two blogs I love: Color in My Piano and Piano Pantry. Ruth Michaelis, you are a gem, and can cook for an army! Wow! Tuesday morning, I spent a lot of time visiting with friends in the exhibit hall (and purchasing far more music than I probably should have!). 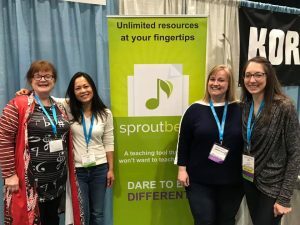 Teacher friends, I love Sproutbeat – and their creators – so much. Be sure to check them out if you’re not already a subscriber! You definitely slow down the last day or two of a conference. Information overload, sore feet, the looming return to reality…it all becomes a little overwhelming. I floated in and out of several sessions, but only have two more to post about that have long-term applications for me. I have the honor of serving with Karen Thickstun (our newly-elected MTNA President-Elect, mind you!) on our Indiana MTA Board of Directors. I deeply admire her intellect, and I always know we’re in for a treat when she presents. Originals: Question Defaults (what Internet browser do you use? ), Procrastinate (studies show delayed decisions tend to be more creative), are Not the First (citing Facebook came after Myspace, Google after Yahoo, etc. – we don’t have to be first; just better), Doubt (self doubt vs. idea doubt), Balance Risk, and Have Lots of Bad Ideas (we fail the most because we try the most). Perhaps the most eye-opening aspect of Karen’s presentation was this: Research shows peer groups and colleagues are the best at predicting the success of our ideas (more than ourselves, our managers, or focus groups). I believe this is why music teachers have been so successful in various entrepreneurial pursuits. Those who excel are often those who have strong relationships with other teachers. It was a real lightbulb moment for me! Practical Actions to Unleash Originality include questioning the status quo, and making sure we solve problems with existing markets (rather than trying to invent new markets). The best time to “shake things up” is not when you’re struggling, but, rather, when you’re doing well. Karen also referenced the phrase, “Creative Misfits” at one point, which I find a very fitting title. Dr. Otten was my first undergraduate professor, and our studies were – well, intense, to say the least. Not only was it a lovely life-affirming moment to find myself presenting on the same program, but the experience of learning from him again – 18 years later – was incredibly cathartic. He is a gifted performer, and a talented orator. It was wonderful to share space with him once again. Also delightful was the fact that he brought new repertoire into my life! This session explored the Piano Etudes, part II., by H. Leslie Adams, as well as R. Nathaniel Dett’s In the Bottoms, and William Grant Still’s Seven Traceries. There were several pieces by Dett and Still that could be managed by mid-late Intermediate students – and I’m quite excited about them! I was later able to purchase this album of the Adams etudes, and I’ve found myself listening to them on repeat. They are full of character, ranging from the profoundly serious to the rebelliously raucous. Well…now we can all see why I don’t maintain a blog! Brevity is never my strong suit. I do hope this has been helpful to anyone who’s come across it. I also hope it inspires you to make the necessary sacrifices to attend a conference. We can read plenty of great information online, and it’s easy to convince yourself that’s enough…but the impact is infinitely stronger when you experience it for yourself! 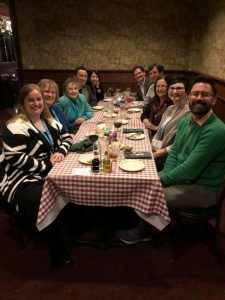 Not to mention, conferences typically go hand-in-hand with amazing food and even more amazing conversation from your fellow (brilliant) music colleagues. Thank you for your notes! Just discovered your blog through Joy Morin’s blog. Thank you for posting such great information and inspiration! Contact me to schedule your first lesson! © 2015 Christina Whitlock. All Rights Reserved. Created and Managed by Skitterbug LLC.